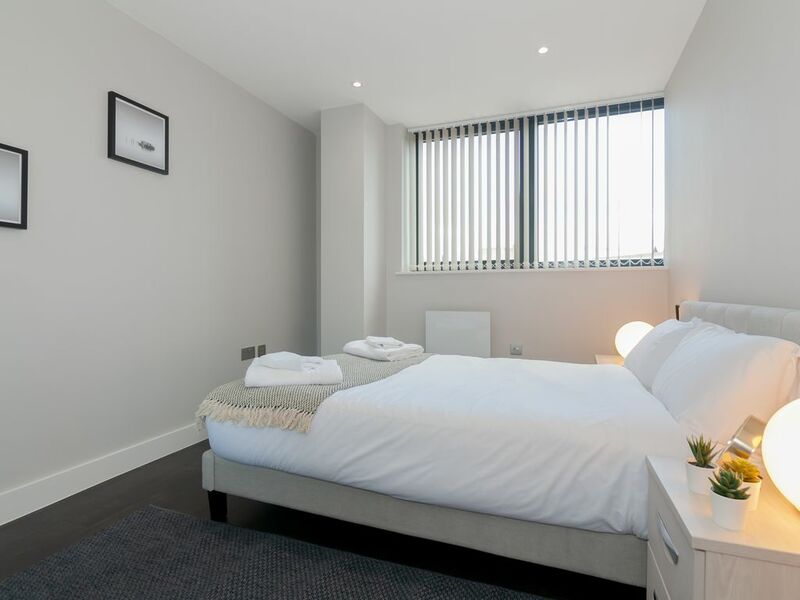 This comfortable 2 bedroom, 2 bathroom Sheffield apartment accommodates up to 6 guests in modern surroundings. Part of a new development, it features brand new appliances and new decor. The comfortable Super King-sized beds are hotel-quality as is the linen on it plus the fresh towels. Together with the consumables you need they make for the most comfortable stay possible! The spacious apartment is set up as a two double bedrooms one with an ensuite bathroom and a large living area with a sofa that can be used as a third double bed. The kitchen is equipped with everything you need to prepare all meals of the day, microwave, fridge/freezer, dishwasher, oven. The apartment is located in the prestigious West Bar development just over the road from the Sheffield Court (hence the name). So if you’re in the area on legal business, staying here really makes sense if you want the shortest commute to work imaginable. Staying here puts you in pole position to make the most of Sheffield’s newest and most exciting large-scale development. West Bar features a mix of office and leisure space, with bars, restaurants and cultural attractions aplenty. You can also easily reach many of the area’s other popular destinations from here. If you’re in Sheffield to check out Sheffield Hallam University or The University of Sheffield, stay here. So too if you’re catching a show or the snooker at the Crucible Theatre. The grounds of both Sheffield football teams can be easily accessed from here too, or if you like things at a slower pace, there are plenty of parks nearby, and the massive Meadowhall Shopping Centre is easily reached, ideal for those of you who are after some retail therapy. And slightly further afield, but only half an hour away, is the beautiful Peak District.